Marc Andreessen, the founder of Netscape who then went on to become a founding partner in the leading venture capital firm Andreesseen Horowitz, wrote a very thought-provoking and often cited piece in the August 20, 2012 edition of The Wall Street Journal entitled Why Software Is Eating The World. (Subscription required.) To vastly oversimplify his thesis, an ever increasing number of businesses are run almost entirely on software and delivered online. He predicted the velocity of this change would continue to increase for the next ten years. A widening gap between the increasing aggregate time spent on mobile devices versus the decreasing aggregate time on desktop systems. Mobile platforms are were users are spending more and more of their “waking hours”. Over time, phone calls and emails will decline while messaging and social media will increase on mobile devices. Very significant business and technical opportunities await in the mobile world. I highly recommend clicking through to all of the above links for this slide deck, conference and report. The slide deck itself is also particularly enlightening about, among other things, growth prospects, market forces, market segments, costs, key companies in different mobile sub-sectors, and mobile supply chain dynamics. There is much to consider here for anyone having anything to do with mobile, which is, by definition, all of us. 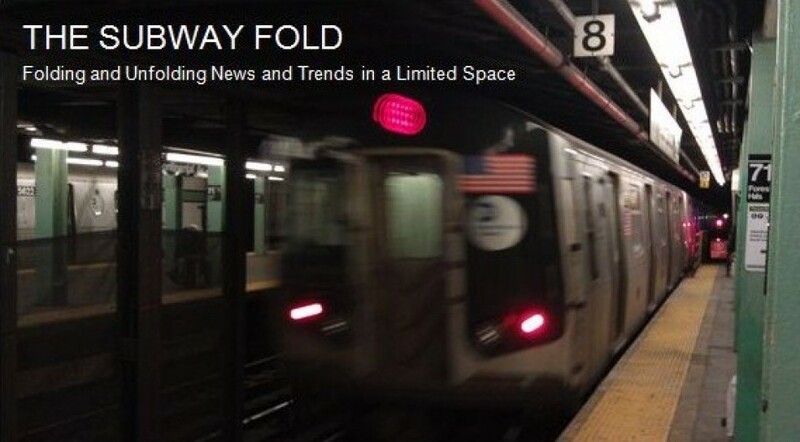 For further reference, I also suggest a look back at this July 31, 2014 post on The Subway Fold entitled Mary Meeker’s 2014 Internet Trends Presentation which also covered the exponential growth of mobile technologies and put that in context and perspective with many other of the very latest trends in online technology, economics and culture. * See also Facebook’s $21.8 Billion WhatsApp Acquisition Lost $138 Million Last Year by David Gelles in yesterday’s (October 28, 2014) edition of The New York Times, that despite this loss, Facebook has an extensive long-term technological and financial plans for WhatsApp. I also recommend a click-through and full read of this for its full coverage and enlightening details of FB’s corporate strategy for this multi-billion dollar messaging platform. Apple’s lead designer, directly involved in the development of nearly all of their iconic devices, is Johny Ive. He and Jobs had a very long and highly productive professional relationship. Jobs often spoke of their deep friendship and mutual admiration. His close following of blogs about design, Apple’s products, rumors and speculation about Apple’s pending products. Apple’s top secret design studio were he works. His lifelong passion for DIY drafting and building of real things. How he and Jobs met, instantly “clicked” as a team and, in turn, how this lead to Apple’s laser-like focus on the philosphy, processes, materials and details of industrial design. Professional relationship with another well known industrial designer. Mr. Ive has carefully and diligently distinguished himself as a singular creative force in a highly competitive global marketplace. I believe there is much to be learned from him in this piece for designers and and non-designers alike in many other fields, about how to excel in your work. Miss it not. * According to an October 15, 2014 story posted on TheHollywoodReporter.com entitled Christian Bale in Talks to Play Steve Jobs, by Tatiana Siegel, the book is going to be turned into a movie. Negotiations are underway to cast Christian Bale in the lead role, with Danny Boyle directing and Aaron Sorkin writing the adaptation for the screenplay. The astronomical diversity of Twitter users and topics never ceases to expand and amaze. Everyone and their neighbor from #anthropologists to #zoologists and countless others post approximately 500 million Tweets each day. This produces a virtual ocean of highly valuable data and accompanying analytics that have found applications in, among a multitude of other areas, e-commerce, marketing, entertainment, government, sports, academia, science, medicine and law. For example, two recent Subway Fold posts here have looked at the mappings of Twitter networks and the analysis of Twitter traffic about TV shows to examine this phenomenon. Taking this to yet another level of involvement and sophistication was an announcement on October 1, 2014 that was posted on Gigaom.com entitled Twitter Gives MIT $10M and Access to the Firehose to Build a Laboratory for Social Machines, by Matthew Ingram. To briefly recap, Twitter is providing funding for a new undertaking at MIT called the Laboratory for Social Machines (LSM). Its mandate is to examine the effects of social media on society, including the creation of new tools (such as pattern recognition and data visualization), and methodologies for doing so. They further intend to create a platform where the findings can be openly discussed and possibly acted upon by the interested parties. LSM will have access to the entire quantum of Twitter posts going back to the social platform’s launch in 2006. Other planned participants will include journalists, “social groups and movements”. Their website provides more fine-grained details about their objectives, approaches and personnel. I highly recommend clicking through to the LSM site to learn more and get a genuine sense that this could really be something big. As well, their own new Twitter feed is @mitlsm. Additional coverage of this story can be found here on The Wall Street Journal’s Digits blog and here on the Boston Business Journal’s techflash blog. What a remarkable and admirable leap forward this is for Twitter and MIT. At its outset, this sounds like a venture that is destined to produce practical and actionable benefits to nterested groups across the real and virtual worlds, not to mention the positive publicity and good will this announcement has already generated. Will other interested parties be invited to provide funding or is this an exclusive venture between Twitter and MIT? What types of new startups will the work of LSM inspire and support? Will LSM expand itself to become an incubator of some sort? What policies will guide the LSM’s decision-making on the types of studies, tools, movements and so on to pursue? Is establishing an advisory board in their current plans? Will other universities build comparable labs for social media studies? Will professional organizations, trade associations, and other specific interest groups likewise create their own such labs? Being a very proud native of New York City, I was thrilled to see an article on TechCrunch.com posted on October 1, 2014, whose title just about said it all with Digital.nyc Launches To Be The Hub For New York Tech by Jonathan Shieber. This announced the launch of a brand new site called Digital.NYC, a hub destination concerning nearly anything and everything about the thriving tech and startup markets here in The Big Apple. For anyone interested in startups, workspaces, incubators, jobs, investing, training, news and access to a gazillion other relevant resources, this is meant to be an essential must-click resource.The site is the product of a cooperative venture by the City of New York, IBM and the venture capital firm Gust. For additional reporting, see also IBM Starts Online Hub for NYC Tech Firms posted the same day on usatoday.com, by Mike Snider. I highly recommend a click-through and thorough perusal of this site for the remarkable depth and richness of its offerings, timeliness, and sense of excitement and vitality that threads throughout all of it pages. While the term “platform” is often overused to describe a program or site, I believe that Digital.NYC truly lives up to this term of art. What also really slew me about this site was its elegant design and ease of navigation that belie its vastness. The site clearly evinces its designers’ and builders’ passion for the subject matter and incredible hard work they put into getting it all just right. What a daunting task they must have faced in trying to meld all of these content categories together in a layout that is so highly functional, navigable and engaging. Bravo! to everyone involved in making this happen. Indeed, for me it passes the Man from Mars Test: If you just landed on Earth and started out knowing little or nothing about the tech market in NYC, some time spent with this site would handily start you on your way to assessing its massive dimensions, operations and opportunities. Alternatively, very savvy and veteran entrepreneurs, investors, programmers, web designers, students, venture capitalists, urban planners and others will likewise find much to learn and use here. I Googled around a bit to see whether other cities had similar hub sites. My initial research shows that there is nothing else per se like Digital.NYC currently online. Please post a comment here or send me an email if you do know of any others out there and I will post them. However, In my online travels I did find a site called Entrepreneurial Insights that has compiled on a page entitled Startup Hubs a series of recently posted in-depth reports global startup hubs. These cities include Paris, Toronto, Boston, Mumbai, Rio de Janeiro, Bangkok, Istanbul, Singapore, Beijing, Tel Aviv, Barcelona, Berlin and New York.